SnapTotes.com is a company that manufactures and markets an exciting product line that allows consumers to put their own photos or images on high quality stylish handbags. Every bag is custom produced. SnapTotes.com is not just about memories; it's about carrying and sharing memories of those people and places that are important to you, your loved ones and friends. Check back at 58Coupons.com for the latest Snap Totes savings, Snap Totes promotions and Snap Totes coupons for SnapTotes.com. Use this coupon code to get 10% off any order from SnapTotes.com. Click link to save. Use this coupon code at SnapTotes.com to save $10 on all single strap bucket bags. Click link now. 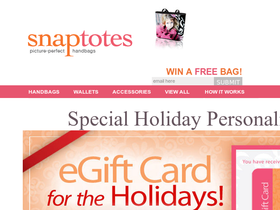 Save an easy 10% when you spend at least $75 at SnapTotes.com and use this coupon code at checkout. Check out Snap Totes and you can create your very own personalized bag from as little as $30. Click link to start.